Popeye the sailor’s first appearance in E.C. Segar’s newspaper strip Thimble Theater is fairly well documented. In the space of weeks the character had evolved from a grotesque walk-on part, to lead character and all-purpose superhero, displacing Olive Oyl’s beau, Ham Gravy, to boot. The early Popeyes are now reprinted as part of a mammoth project to republish all of Segar’s ten-year run from the 1930s, daily and Sunday strips both. I had just started reading the first volume when I was struck down by my recent flu, and I found it an excellent companion in times of illness — buy it, it could work for you too. 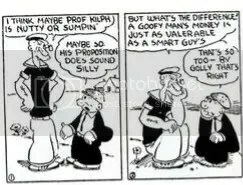 Popeye himself may be one of the most complex comic characters ever. Noble-hearted and fearless, he is also dishonest and opportunistic (like everybody else in the strip). Simple (“I thinks with me fisks.”) and superstitious (“I ain’t afraid of nuthin’ ‘cept evil spiriks.”) he can still outsmart his “emenies”. Introduced into a whodunnit, he socks the butler in the jaw on general principles, only to discover, pages later, that (spoiler alert) the butler did it. When he vows (about once every couple of weeks) to quit fighting for Olive’s sake, he is generally sincere, and will maintain that unassailable sincerity even while slugging some yegg in the breadbasket a panel later. At first, Segar’s fondness for repetition is a little disconcerting. But as with Laurel and Hardy, a certain familiarity with the characters, a certain predictability, can add to the comedy. There’s generally a variation in the way a gag is delivered, even if it’s the same old gag. And Segar’s glee at repeating a favourite joke is infectious — swimming instructions to an enemy, “Lie back and open your mouth, there’s nothin’ to it!” is even better the second time around, since it has the familiarity of an old friend. This being the ’30s, there’s a sense of danger to the constant political incorrectness. Guns are blasted left right and centre in a way that might cause concern to modern editors. Olive is both victim of violence from bad guys (Popeye even slaps her at one point) and perpetrator, shooting thirteen cattle rustlers in the shoulder, one after the other. “I’m too kind-hearted to blow his head off,” she remarks of one fallen foe. “I’ll drop him into the cellar — maybe he’ll break his neck.” Golliwog-like cannibals are seen to menace our heroes, and animals are enthusiastically assassinated. Throughout it all, Popeye displays the near-invulnerability of the superman, which Segar is able milk for a surprising variety of comic and dramatic situations. When Popeye hits a man so hard he breaks his own arm, it’s further proof of his own toughness. The other characters always react as if Popeye was normal, cringing and blanching as he is hit with furniture or plugged with slugs. “Pour lead into him till he sinks to his neck in the desert sands,” instructs John Holster, bad man. But Popeye ignores bullets. With his gambling, drinking and fighting, not to mention a surprising emotional vulnerability, Popeye still has plenty of weaknesses, and part of the strip’s interest comes from putting him in the wrong and watching him struggles his way to the right. The Popeye of the Fleischer bros’ animated cartoons is altogether less complicated. It’s a strange feature of the movie-comic relationship that when cartoon characters are adapted for the big screen, they’re generally simplified. Movie snobs would expect them to require the addition of depth and nuance, but this is more usually subtracted. “I think most comic book movies are made by people who don’t read comic books and despise those who do,” says Guillermo Del Toro. Despite the fact that there’s really only one plot (Popeye must eat spinach and rescue Olive from Bluto) in the Fleischer toons, they are things of beauty in their own right, due mainly to the sheer artistry of the animation and the pitch-perfect vocal perfs of Jack Mercer and Mae Questel (also Betty Boop). With moving images at his disposal, Popeye could also partake of more strenuous forms of knockabout, with more elaborate consequences. I was always wowed as a kid by the way the hero could punch an offensive building so hard it would breaks into pieces, fly through the air, and reassemble in some new and more innocuous form. 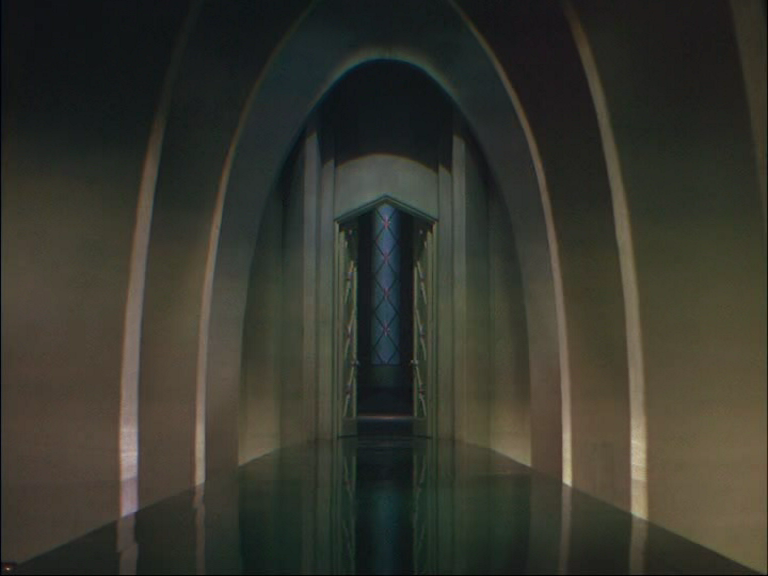 It’s no accident that the Fleischer studio was also behind the early SUPERMAN cartoons. Given his violent, profane, anti-social nature, it’s an oddity that Popeye should be adopted by the Disney Corporation in 1980. But everything about Disney at that time was rather odd. They would make dark, disturbing films (SOMETHING WICKED THIS WAY COMES, DRAGONSLAYER, THE WATCHER IN THE WOODS) and then not know what to do with them. Only an essentially headless entity, or a brilliantly mad one, would hire Robert Altman to make a childrens’ film. For some time, I think, POPEYE has been considered a low point in Altman’s career, and it did lead more or less directly to his ten years in the wilderness (ten very productive years, it should be stressed) before his mainstream “comeback” with THE PLAYER. These days, POPEYE is regarded with some affection, I think, cemented by PT Anderson’s use of the song “He Needs Me,” on the soundtrack of PUNCH DRUNK LOVE. At the time, the film was seen as a commercial and artistic disaster. Wolf Kroeger’s Sweethaven design is worthy of a Terry Gilliam film and then some — beautifully wonky and dishevelled. The idea of hiring Fellini’s cameraman, Guiseppe Rotunno, seems inspired. While nothing in the C.V. of Altman’s regular costume designer, Scott Bushnell, would indicate an aptitude for this kind of stylised work, his character designs are crucial in transforming the familiar players into their pen-and-ink counterparts. I would stand that man a pint just for creating Olive’s boat-like boots. Also: Harry Nilsson’s music and songs. Pretty remarkable! Here we have the lyrical equivalent of Segar’s obsessive repetition. Hmm, maybe they’re a bit TOO repetitive? Still, they’re beautiful. Altman’s biggest handicap as director might be his love of muddle. Slapstick comedy tends to require absolute clarity to work, which translates either into a long-take style that observes the action in a simple long-shot composition of maximum simplicity (Keaton) or a hyperbolic action-movie approach that divides each unit of movement into a brief but legible shot. Altman likes to have everybody talking at once, in a cluttered, busy environment, and his cutting deploys angle-changes almost haphazardly: if the first angle doesn’t show the gag to perfection, the second will allow you another view, from which you might be able to figure out what’s happening. You feel like a reaction shot of a dog cocking its head at some inexplicable human behaviour. This has the effect of flattening some of the well-staged slapstick, as far as laughs are concerned, but it’s not in itself a displeasing thing. What contemporaneous audiences couldn’t appreciate is that POPEYE isn’t really a children’s film or a comedy or anything normal like that. It’s purpose is not laughter so much as wonderment — it’s a Heath Robinson / Rube Goldberg contraption whose pleasure derives from its beauty and fussy complexity, rather than from anything it actually achieves. Sadly, such films have a history of under-performing at the B.O.